Esterline Connection Technologies is a world leader in high performance, highly reliable interconnection solutions for the aeronautic, defence, aerospace, energy, transport and manufacturing industries. Since 2015, its two brands SOURIAU and SUNBANK, have applied the Continuous Improvement approach to performance criteria defined by the Esterline Group. Market pressure and demands from major customers force the company to continuously improve its performance in all areas, and especially those most visible to the customer, namely logistics, quality and new product development. For example, to get into the top ten ranking of the best suppliers, a 99% rate of on-time delivery is now needed, whereas the norm was 98% only a few years ago. To sustain and improve service and quality performance levels, the whole organisation of the company has to continuously re-examine itself. The E3 approach (Esterline Enterprise Excellence), which was established in 2015 for all Esterline's business activities, has actively promoted the Continuous Improvement method and set up an organisation in each SOURIAU and SUNBANK site. It is in charge of carrying out training courses, providing practical tools and moderating the working groups. Each year, an analysis is made of the actions taken and the results obtained in order to improve the methods used. Stéphane Morillon, director of the Continuous Improvement department explains: "As soon as the programme was put in place, our goal was to ensure that all the personnel get 4 complete days of training organised by the CIF (Continuous Improvement Foundation) Academy. The programmes are based on various games that simulate production situations. During these four days, the participants, guided by a trainer, discover that thanks to their actions, they are capable of achieving exceptional results". Stéphane Morillon continues: "Each participant chooses a role in the production chain. As the training progresses, everyone sees that it is possible to produce more, under better conditions, by eliminating unnecessary actions. Because it is based on real evidence and a large amount of individual participation, group cohesion grows stronger." The Continuous Improvement approach has been deployed at all of the SOURIAU and SUNBANK sites. So, at the beginning of 2018, in the SOURIAU site located in Champagné, Sarthe, members of the personnel, including operators, department managers and company directors proposed 50 Continuous Improvement projects. The selection committee chose 25 (which was the maximum that could be put in place for this site in a year). In each case, the project concerned a concrete and precise subject. For each project, a working group held a 4-day meeting to propose some solutions to be implemented. How does a Continuous Improvement project work? Stéphane Morillon: "A group of 7 or 8 people is constituted for each project. They all have different functions and come from different worlds: operators, engineers, support services, external contractors, etc. Once the subject has been fully defined, the group spends a week working with the help of a facilitator from the Continuous Improvement department, who moderates the discussions. The objective is to end up with concrete solutions to concrete issues: how to reduce a cycle time, or support the integration of a new family of connectors into production, improve a logistic node, review the marketing plan for a product launch, improve management reporting, etc. All topics proposed by all departments are acceptable and are analysed together with the owners of the project and interested colleagues." A team of three facilitators, trained in using the Esterline E3 tools has been set up in each SOURIAU and SUNBANK site. They consist of people who are very familiar with the company with long professional experience. They organise the improvement projects, and using the E3 methods they synthesise the topics that have been presented, facilitate discussion between the participants and moderate the meetings. Because all the projects relate to everyday practice and are analysed by people working in the field, solutions appear and are implemented easily. The role of the facilitator is to enable solutions to emerge, which come from the participants. 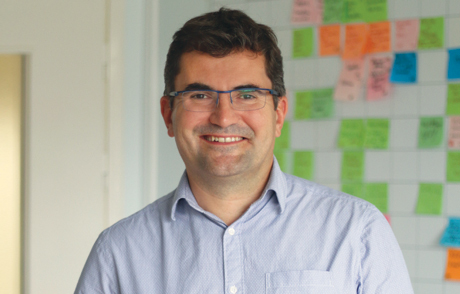 Stéphane Morillon: "When the Continuous Improvement programme was launched in 2015, the presence of a facilitator was indispensable for applying the method. As time goes by, the teams have mastered the tools and have become more and more autonomous. Now the facilitators participate only occasionally in the improvement projects. Our role is also transversal. We take the results and the proposed solutions obtained from a project to the other factories, which face the same situations. We measure the results of our Continuous Improvement operations, using a ‘before and after’ approach, and make regular reports on the actions taken." The method has demonstrated its worth by showing that its purpose is not to put people under pressure, but to help them to reflect together about better ways of working, in a more efficient manner. Even the people who were most reticent at the outset are now interested in the process and in some cases actively participate in projects. What is happening is that everyone is able to see the real benefits for their everyday work, company profits and customer satisfaction. Continuous improvement has now become one of the tools for helping teams progress and the company to be more cohesive. Everyone, by applying this code of practice, can improve their efficiency and serve customers better.